The defendant in a murder trial in Stockton, California, was shot dead Wednesday after attacking the judge during a courtroom recess, authorities said. David Paradiso, suspected in the stabbing death of his girlfriend, was on the stand when the judge dismissed the jury for a recess after the defendant’s mother became upset and walked out of the courtroom, according to witnesses and court officials. Paradiso then jumped up, ran behind Judge Cinda Fox and began punching her, said Karen McConnell, spokeswoman for the San Joaquin County courthouse. Deputies fired three shots at Paradiso, who was killed, she said. 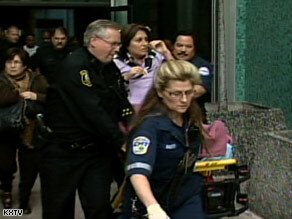 Video from outside the courthouse showed Fox being wheeled out in a stretcher and into an ambulance. Her left elbow was wrapped in gauze, but she otherwise appeared alert. When approached by reporters, she said, “I’m OK,” but declined to comment further. An elderly man wearing a juror badge also was wheeled out of the courthouse. He said he was in the same courtroom and he said the judge had been stabbed in the neck, but Fox did not appear to have any such injury. It was not clear from the video whether the elderly man was injured or ill.